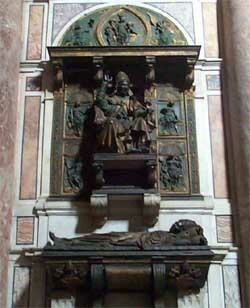 Pollaiolo's monument was the only one to be transferred from the Old Basilica. The pope's left hand shows the lance that pierced Jesus' side. 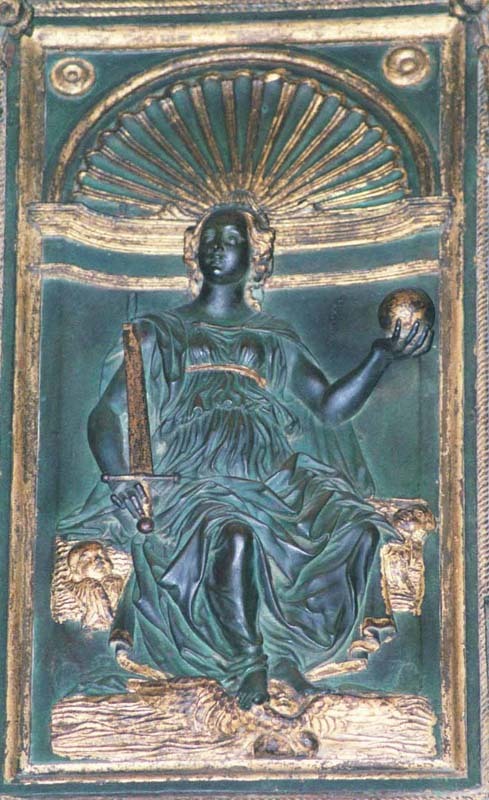 The actual relic, presented to him by the Sultan, is now kept in the Loggia above the Veronica statue. Next to the Pontiff are four cardinal virtues: Prudence, Justice, Fortitude and Temperance. 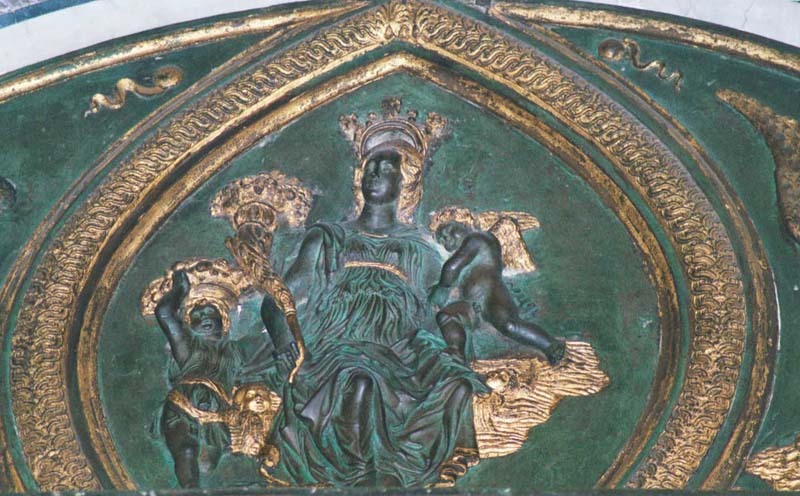 The upper lunette displays the three theological virtues: Faith, Hope and Charity. In the passage leading to the next chapel, on the inner side, is the oldest and smallest monument in the Basilica, the sepulcher of Innocent VIII created by Antonio Benci, known Pollaiolo, with the help of his brother Piero. Completed in 1498, it was originally in the triumphant arch of the Old Basilica; it was then moved to the so-called aisle of the Shroud in the New Basilica and was finally re-composed here in 1621, with an unexplainable inversion of the statue lying on the sarcophagus, formerly higher up and now lower, and the seated one of the Pope. The two statues are symbols of the splendors of imperial majesty and the equalization of death which strikes all mortals alike. Above in the lunette, the three Theological Virtues are sculpted in bas-reliefs, beside the four Cardinals. 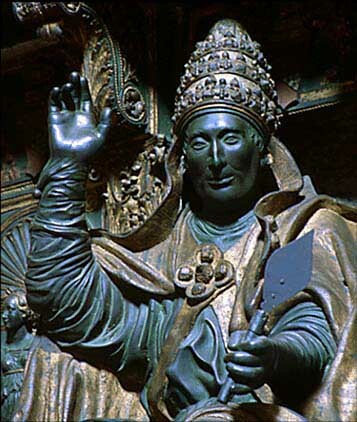 In his left hand, the Pope holds the iron of the holy spear which wounded Christ's side on the cross, donated by the Sultan Baiazet in 1492; the point is missing and this was held in the Royal Chapel in Paris until the French Revolution. In the inscription beneath the statue are several inaccuracies, such as the discovery of the New World at the time of the Pope, who, however, died eight days after Columbus left on his voyage. It is also worth mentioning that Innocent VIII battled with unsuccessful insistence to promote a great crusade. After being moved the first time in 1606 to the so-called aisle of the Sudarium, the monument to Pope Innocent VIII was placed in its current location in 1621, and arbitrarily recomposed. 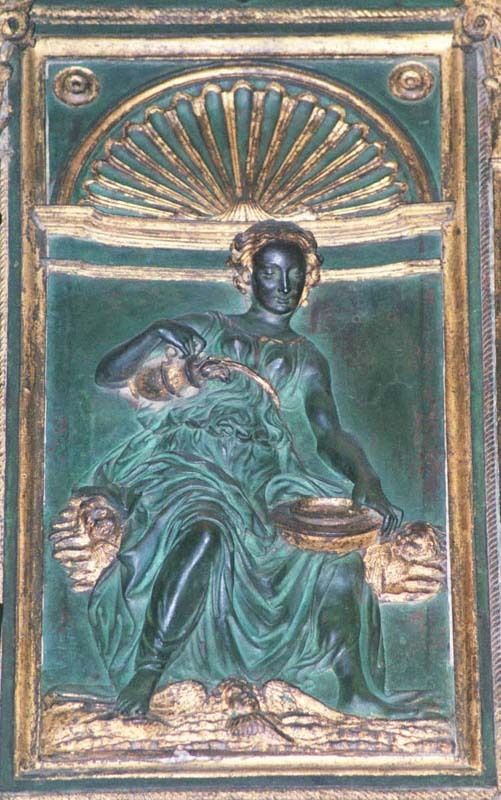 In fact, the position between the seated statue of the Pope was reversed, initially located at the bottom, with the one lying on the sarcophagus, which was originally at the top. Despite these changes and other minor modifications, Pollaiolo created an important work, both from an iconographic and artistic point of view, though without attaining the exceptional quality that instead can be attributed to the monument to Sixtus IV. 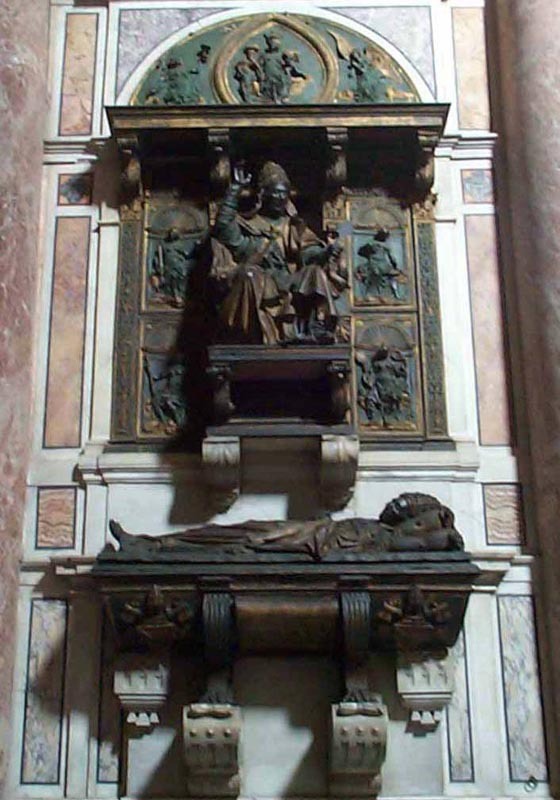 Returning to the traditional scheme of the so-called airborne wall sepulchral, Pollaiolo introduced original innovations, such as the double representation of the Pope, lying on the sarcophagus, to symbolize the equality of men in the face of death, and seated on a throne, to represent the pinnacle of those who reign, with the right hand in the act of blessing and the left hand revealing the remains of the sacred lance which wounded Jesus' side on the cross. 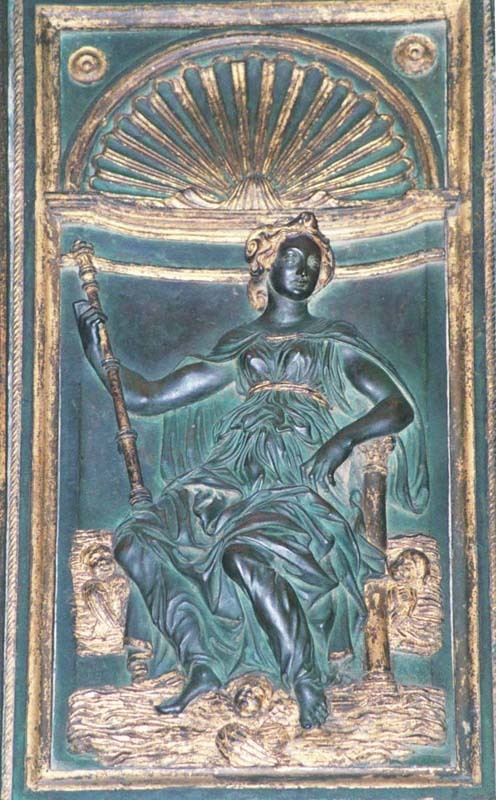 The seated figure, with fully rounded sculpting, is flanked by bas-reliefs of the "Four Cardinal Virtues," and is surmounted by a lunette with the "Three Theological Virtues." 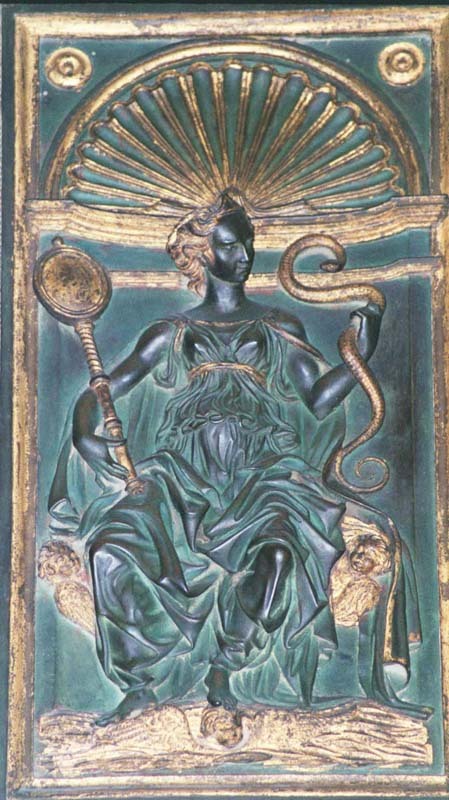 The energetic modeling of the bronze, which is elegant and bright, creates modern dynamic effects, though in some details, probably due to the work by Piero (Pollaiolo's brother), those effects are weakened by a certain expressive roughness, still bound to the Florentine art of the first half of the 15th century. The monument does have some historical inaccuracies, as already widely noted by the critics. The inscription under the statue should indicate "sedit" ("reigned") instead of "vixit" ("lived"), and 1492 instead of 1497. In the inscription under the sarcophagus, the word "Imp." (or "emperor") was replaced by the word "tyrant," with reference to the sultan Baiazet, son of Mohammed II, who presented the remains of "sacra lancia" (the sacred lance) as a token of perennial gratitude for the confirmation of entrusting to the Pope his rival brother Zizim, who had already sought refuge with the Knights of Rhodes. Finally, the epigraph erroneously records the discovery of America during the papacy of Innocent VIII, who in reality died a few days after Columbus departed from Palos. The chief concern of this pope, whose kindliness is universally praised, was the promotion of peace among Christian princes, though he himself became involved in difficulties with King Ferrante of Naples. His close friend, Cardinal Giuliano della Rovere (later Pope Julius II), largely directed the papal affairs. Like his predecessors, Innocent wished to stop the Turkish advance, but he succeeded by means other than the crusade he originally planned. Djem, brother and rival of Sultan Beyazid II, was being held captive by Pierre d’Aubusson; the pope saw that if he held over the sultan the threat of supporting Djem’s pretensions, Beyazid would come to terms. Beyazid (1490) agreed to leave Europe at peace if the pope kept Djem captive. He agreed in 1489 to hold Sultan Bayezid II's brother prisoner in Rome in exchange for a yearly ransom and the Holy Lance of St. Longinus, the spear thrust into Christ's body at the crucifixion. On 5 Dec., 1484, he issued his much-abused Bull against witchcraft (q.v. 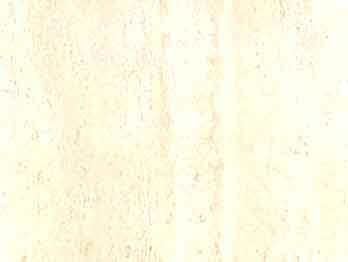 ), and 31 May, 1492, he solemnly received at Rome the Holy Lance which the Sultan surrendered to the Christians. Constantly confronted with a depleted treasury, he resorted to the objectionable expedient of creating new offices and granting them to the highest bidders. Innocent VIII was known as a nepotist and was attacked by Savonarola for his worldliness. To God, Excellent, Maximum. To Innocent VIII Cybo, pontiff, perpetual custodian of the Italic peace, distinguished for the glory of the New World discovered in his time, for having imposed the name "Catholic" on the king of Spain, for having recovered the title off the holy cross for spear that pierced the side of Christ sent as a gift by Bajazet tyrant of the Turks (This) perennial monument, moved here from the old basilica, Alberico Cybo Malaspina, prince of Massa, duke of Ferentillo, marquis of Carrara etc., his great nephew, with great decorum and magnificence placed it in the year of the Lord 1621.